Gain complete visibility into all logon activity on your RADIUS Server, both successful and failed, with actionable audit data that contains who-what-when-where details. Use this insight to spot suspicious access attempts and address auditors’ requests. Stay on top of failed logons on your RADIUS Server with the Google-like, interactive data search. It helps you detect and investigate illicit attempts to access your network so you can better protect your critical assets against unauthorized access in the future. Keep your audit data safe and at your fingertips in the two-tiered storage for years. You can instantly access it the next time you need to perform a security investigation or undergo a periodic audit check to prove your compliance. 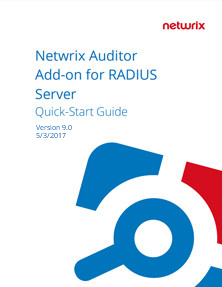 Review detailed instructions for installing the Add-on for RADIUS Server. Start getting complete visibility into all logon activity on your RADIUS Server.